Fall is not only about lower temperatures, it is also the high season for flavorful & vibrant yams! We’ve been experimenting a lot with recipes including yams at KptnCook and here is the culmination of them all! So, what’s your favorite way to cook yams? Right, it’s hard to pick just one, so don’t! our thirteen favorite ways to prepare yams! From fries to ice-cream we’ve tried it all and we’ve been blown away. Some of it may be familiar to you, but hopefully at least one comes as a tasty surprise. 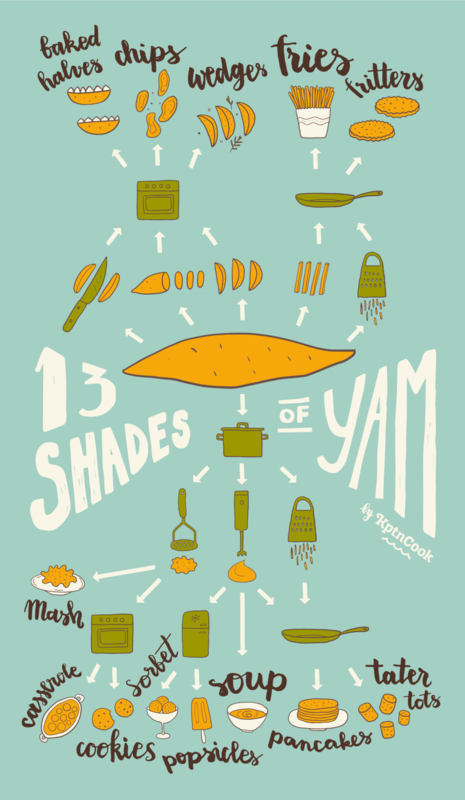 If you as a fellow yam lover you have a recipe we missed, please comment it below! We would love to yam it up! Feel like yaming? Here’s a selection of our favorite yam recipes! Posted in Foodie Talk and tagged cooking, cooking hack, food facts, food fun, food hack, how to, infographic, kitchen hack, sweet potato, sweet potato fries, sweet potatoes, thanksgiving, thanksgiving recipe, yam. Bookmark the permalink. What a beautiful graphic! Thank you for including my pops. I wish it were still warm enough out here to eat them! Stay tuned for more articles like this one.